In the Pacific the Dobu islanders make much use of ginger in their magic. They chew it and spit it at the “seat” of an illness to cure it, and also spit chewed ginger at an oncoming storm, while at sea, to halt it. Ginger has been used as culinary cooking spice for nearly 4500 years. Highly valued as a spice, ginger has been used medicinally for thousands of years by Chinese physicians. In ancient China, sailors chewed ginger root to prevent motion sickness. For centuries, ginger has been prescribed by Ayurvedic and Indian healers to treat the pain and stiffness associated with arthritis. In Japan, ginger’s anti-parasitic effect is put to use in the preparation of sushi, which is traditionally eaten with pickled ginger. In the laboratory, ginger extracts have been shown to kill the anisakid worm (a parasite sometimes carried in raw fish) within sixteen hours. This covers the length of time the parasite would have to establish itself in the digestive tract after consumption of the contaminated fish. Ginger is essential to Asian dishes. *Growing ginger root is not difficult. If you can resist harvesting for the first two years, you will be able to get a year’s supply and plenty left over: edible ginger root and ginger root planting material. * Ginger is a slow growing plant and is easily overgrown by others. *The plant only grows to 2-3 feet in height and does not take up much space. *Ginger is a tropical plant and loves a sheltered spot, filtered sunlight, warm weather, humidity and rich, moist soil. * What ginger cannot stand is frost, direct sun, strong winds and soggy, waterlogged soil. * Ginger needs a lot of moisture while actively growing. The soil should never dry out. Don’t overwater, though, because the water that drains away will take nutrients with it. Ginger loves humidity. If you have problems with dry air then regular spraying and misting might help. A sheltered, moist spot in a warm climate will provide enough humidity. –> The easiest way to get started growing ginger root is to get a few fresh rhizomes. Make sure you select fresh, plump rhizomes. Look for pieces with well developed “eyes” or growth buds. (The buds look like little horns at the end of a piece or “finger”). Some people recommend soaking the rhizomes in water over night. That is not a bad idea, since shop bought ginger might have been treated with a growth retardant. However, do NOT sit rhizomes in water until they sprout roots. It is much better if the roots are in the ground and can breathe right from the start, rather than having to deal with the transplanting shock and the change in conditions. If the ground is moist and warm they will root very easily. –> Whether you grow your ginger root in a pot or in the ground, you do need really good soil to start with. It needs to be rich enough to feed your ginger (you can always add some fertilizer), it needs to hold enough moisture so it doesn’t dry out, but it needs to be free draining so the ginger roots don’t become water logged. –> The best planting time is late winter/early spring (late dry season/early wet season in the true tropics). Make sure you select a spot where the plants get plenty of light but no direct sun and where they are protected from the wind. –>You can cut or break up the ginger rhizomes in little pieces with a couple of growing buds each or you can just plant the whole thing. Plant your ginger root 5-10 cm deep, with the growing buds facing up. –> Towards the end of summer, as the weather starts cooling down, your ginger will start to die back. Reduce the water; even let the ground dry out. This encourages the ginger to form rhizomes. Once all the leaves have died down your ginger is ready for harvest. *Plant them about 6-8 inches apart. *Mulch it thickly. It helps to keep the ground moist, it helps feed the ginger as the mulch breaks down and it also keeps down weeds. –> Grow indoors when living in a colder climate. It will be too cold outside in spring. *Your ginger will need all the sunlight it can get. *Definitely move it inside at the first signs of cold weather. * A clump needs to be about two years old to flower. So if you want to see your ginger flower leave it in the ground and just dig very carefully at the edges of it to harvest bits here and there. –> The best time to harvest ginger is any time after the leaves have died down. Usually it takes 8-10 months to get to that point. –> Break up the rhizomes, select a few nice ones with good growing buds for replanting (you can replant them straight away) and keep the rest for the kitchen. –> The rhizomes that have been replanted or left in the ground do not need any water or attention until the weather warms up again. Watering them doesn’t seem to hurt them either. ** The other way to grow and harvest ginger is to have many clumps growing around your place and to just dig up what you need, when you need it. The plants grow outwards from the mature rhizomes. Once a clump is big enough you can harvest the mature tubers without damaging new shoots. If you are growing ginger root in the garden you can start stealing little bits of it once it is about four months old. Just dig carefully at the side of a clump. (This “green ginger” does have a lot less flavour than the mature stuff). Simply peel, chop and freeze the harvest. * Eating ginger before performing spells will lend them power, since you have been “heated up” by the ginger, this is especially true of love spells. Also ensures the success of a magickal operation. These effects make it useful in treating a number of disorders marked by swelling and pain, such as arthritis. Arthritis: Make a paste of 1 teaspoon red chilies and fresh ginger in half a cup of sesame oil and strain. Gently rub this oil on the painful joints. v Ginger is an even more effective anticoagulant (stops blood from clotting) than garlic or onions; gin-gerol, one of its compounds, has a structure very much like that of aspirin, which also thins the blood. Ginger is an inexpensive, effective and nearly universally available remedy for inflammation and pain! Ginger is a folk remedy for menstrual cramps. Relieves pain by producing heat. v Cleanses the colon, ginger has been shown to inhibit the growth of tumours in the colon in animal studies. 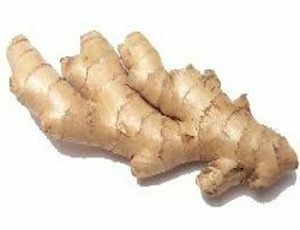 When it comes to quelling the queasiness of motion sickness, ginger has no equal say herbalists. In fact, researchers have demonstrated that ginger beats dimenhydrate, the main ingredient in motion sickness drugs such as Dramamine, for controlling symptoms of seasickness and motion sickness. In addition, ginger has none of the side effects, such as drowsiness, of the commercial drug. Take a 1-gram capsule of powdered ginger root about an hour before you embark and another every two hours or as needed (without exceeding 10 grams a day) during a journey. You can also buy crystallized or candied ginger to take traveling with you. Use ginger teas or capsules to prevent nausea or motion sickness. Ginger juice produces better recovery from symptoms of nausea than ondansetron, a commonly prescribed drug during chemotherapy. Nausea: Slice fresh ginger root into a mug, use 1 table spoon of grated ginger root per cup, and fill mug with boiling water. Cover the mug and allow to steep for 20 minutes and drink when cool enough to do so. NASA found it would counter the nausea of space-sickness. Pets: For carsickness: Try giving a few drops of ginger root extract prior to the trip to settle his tummy. If it is a long trip, you may want to administer the ginger again halfway through the trip. v Alleviates symptoms of gastrointestinal distress: bowl disorders, indigestion, stimulates digestive activity, eases pain from gas and diarrhea, settles the stomach, stomach aches, treats cramping that accompanies constipation, improves the function of the muscles in the gut, ginger root extract (gingerol) inhibits the growth of Helicobacter pylori in the digestive tract, which is a bacterium linked to stomach cancer. Digestion: Fresh ginger is used to help break down high-protein foods such as meats and beans and lessen the effect of uric acids in the body from eating these foods. Dried ginger feeds the properties of foods and herbs to the lower extremities such as the colon, kidneys, ovaries, sexual organs, and legs. Ginger also can settle stomach upset caused by food allergies. Ginger inhibits the production of immune-system components called cytokines, chemicals that create a long-term tendency toward inflammation. Try some ginger ale to sooth the stomach. It’s best to drink flat ginger ale at room temperature (cold beverages will irritate an upset stomach). Take tiny sips, especially if you have already vomited. If you can keep that down, sip a bit more. If you’re out of ginger ale, you can try making a cup of ginger tea (with grated gingerroot). Some people even find relief by nibbling on a gingersnap. v Ginger helps the body to sweat, so toxins are drawn to the skin’s surface. To prepare the ginger bath, place half-inch slices of fresh ginger in boiling water over a stove; turn off the heat, and steep for thirty minutes. Remove the ginger, and add that water into a tub already filled with hot water. Ginger tea is a good herbal tonic for influenza because of its soothing qualities and its antiviral abilities. To make fresh ginger tea, cut a one-inch slice of fresh ginger root into small slivers. Place the ginger in a pot and simmer at a near boil for about 15 minutes, then strain into a cup. Add a little honey to taste. v In China, ginger has been put to the novel use of helping to turn breech babies by giving the mother ginger teas before delivery. v Ginger supplementation helped to modulate immune activity in a beneficial direction, suggesting usefulness in control of chronic inflammation and autoimmune diseases. * Can cause stomach distress if taken in large quantities: Fresh ginger contains compounds called shogaoles, which can cause stomach irritation in some people. * Ginger’s only side effect is occasional minor heartburn. * Avoid if you are pregnant! Ginger is said to be safe but may not be. * It works well for pets and children. * It is possible that too much ginger can give you acne. It is a warming food and with too much heat, it may produce heat on the face, which would give acne. But you would have to eat a lot of it. The rhizome is used fresh, dried, pickled and preserved. *Chewing fresh ginger is more effective than ginger tea. If you take ginger for medicinal purposes, the powder form is the best because of its high concentration of nutrients. Take 4 grams (about 1 teaspoon) of powder divided in two to four doses over the course of the day. Ginger oil can be used in a vapouriser to stimulate the senses or infused with a carrier oil and used as a rub. The oils to use are peppermint, ginger or cardamom. Mix 10 drops of essential oil in 1 tablespoon carrier oil. Ginger can be grated into foods to add flavour as well as being beneficial to the body. Dried ginger in capsules or in juice is taken to avoid carsickness and seasickness. Use about one half teaspoon of the powder. A ginger compress can soothe carpel tunnel syndrome. For headache relief: make a paste of ground ginger and water, apply to temple area. For cough relief: mix 1/2 teaspoon of ground ginger with 1 teaspoon of honey. Fresh ginger root relieves the sting of minor burns and can prevent and fight heartburn by absorbing stomach acid. You can make a tea with powdered ginger, or use up to a tablespoon of fresh ginger per cup of water for a strong brew. 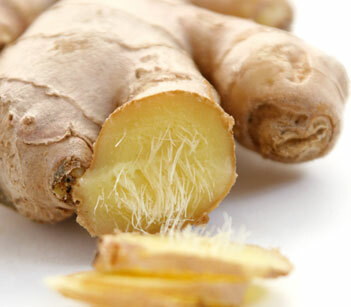 Volatile herbs such as ginger are easily extracted into water and therefore prepared as teas. Cold & Flu Fighter : This spicy tea relieves swollen nasal passages and calms an upset stomach. Place an inch of the herbs in a quart jar. Fill with hot water and steep for two hours. Strain and refrigerate. Reheat whenever you need relief. Make a strong tea with freshly grated ginger (about 3 teaspoons per cup of boiling water), steep for about 5 minutes then stir in a spoonful of honey and sip. Chop about two inches of the fresh root, cover with one cup of water, and simmer for about twenty minute, or one-half teaspoon of the powdered root can be simmered in one cup of water. Add lemon juice, honey and a slight pinch of cayenne. A few teaspoons of brandy will make and even more effective remedy for colds. Brew a tea with 1/2 teaspoon ginger per cup of boiling water. Strain before drinking. Layer in order given in glass baking dish – bake in the lowest oven temperature until done (mushy). Strain and bottle. In a hurry? You can microwave it and use a simple white onion, but the above slow-cooking recipe is preferred to get all the goodies cooked through each other. Type of ritual: offertory, success, power. The root can be placed on the altar and around the circle as an offering to the Earth Dragons. Grow ginger roots to attract success; sprinkle the powder in your purse or wallet. Earl Mindell, R.Ph., Ph.D., Earl Mindell’s Supplement Bible: A Comprehensive Guide to Hundreds of NEW Natural Products that Will Help You Live Longer, Look Better, Stay Heathier, … and Much More!